Throughout the spring the Indiana Athletic Department and the Football program continuously dropped hits about the fact that something big was coming on June 3rd. What could it be? Was it new jerseys, a new tradition they would try and create, or was it a candy-striped football field?! It turned out to be none of those, however it was exciting nonetheless. It was unveiled that the Hoosiers would be sporting five new helmet designs throughout the 2013 season. Helmet changes are nothing new at IU. This is not a program like Ohio State or Michigan who have iconic helmets. So if there isn’t much tradition in regards to the helmets it makes complete sense to stay on trend and help use them as a recruiting tool, to further brand the “New Indiana Football”. The helmets try and touch different eras, themes, and materials. One even lays claim to the state flag, something I am sure that another university was none too thrilled about. Today were going to take a look at each of the five new designs that were created for the 2013 season. We break them down, rank them and tell you the strengths and weaknesses of each. So enjoy our Hoosier Helmet Power Rankings! This was the obvious headliner of the group. It has long been a fantasy of many Hoosier fans for Indiana Football to adopt the famed candy-stripes into their uniform. There have even been rumors that have swirled around for years that it was a possibility, but to no avail, until this year! The chrome helmet fad kicked off when they were debuted at the 2012 Rose Bowl by who else, the Oregon Ducks. The pioneers of the multi-uniform movement, the Ducks once again put the sports fashion world on notice. It now seems as if at least half of college football teams have a shiny metallic helmet of their own. What make the Hoosiers helmet unique to the others that are out there are the candy stripes. 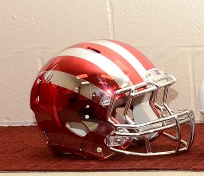 This helmet should get students and recruits excited about the direction of Indiana football in the future. Finally Indiana has stepped into the 21st century, even if it’s just a foot. Indiana has long been behind the times when it comes to being on the cutting edge of uniforms, which I whole-heartedly blame the athletic departments relationship with addidas for this. I love the idea of this helmet. It’s the perfect mix of modern coolness while still being able to bring in a traditional theme like the candy-stripes to the gridiron. I do not like the execution of the helmet. The orientation of the stripes on the helmet kind of make it looks like a super shiny red Michigan headpieces. I am also not a huge fan of the fact there is no IU insignia on the helmet. Sure that’s the case for other programs, but those usually have rather recognizable headgear that you identify with the program already. The Hoosiers first broke out the white helmets against Virginia in 2011. In 2013, there will be two versions of the white helmet, with the interlocking IU getting an upgrade. The helmet is a base white with a modern crimson stripe down the middle of the helmet. Prior to the 2011 season I had been begging for the Hoosiers to come out with a white helmet and I was literally jumping out of my seat when I saw the team come out for warm-ups with the white domes. The new white helmets give the Hoosiers a more modern look, while keeping the traditional IU colors, instead of going to a black like so many schools have done in the last few years. While there is not much to dislike about these helmets, the stripe down the middle isn’t my favorite, but all in all this is win across the board. However, I do think it would have been cool to put a crimson facemask onto one of the two white helmets. This is a play off of the white interlocking IU helmets. While for the modern (read: young) fan this will immediately remind you of Alabama’s helmets. It is a bit of a nostalgia play, as many programs displayed player’s numbers on the side of their headgear, including the Hoosiers who wore a helmet similar to this back in the late 1950s until 1961. I like the throwback feel, while still giving it a fresh look for the Hoosiers. While I am not even close to old enough to see the earlier incarnation of these helmets, I appreciate the look back to earlier years. I again don’t love the stripe down the middle, but even more so in this case. I feel that the clash of the vintage numerical decal look with the modern stripe makes the helmet look as if it has a bit of an identity crisis. I also would have liked to see them incorporate the IU logo on the front of the helmet as they had back in the original version. Wisconsin had a throwback helmet with their “W” on the front in similar fashion. A true throw back to the days of Anthony Thomson, Trent Green, and even the 1967 Rose Bowl team, the Block-I is a classic look that was last seen in the 2007 Bucket Game. While the Block-I is not the most famous IU logo, it does bridge generations of fans together. I have always loved the concept of the Block-I helmet. The 2007 Bucket Game Helmet was one of my all-time favorites. The helmet will bridge the gap between the older generations of Hoosier fans with the younger current fans. While the helmet is pretty old school looking it does give another fresh look for Indiana football. While I do love the Block-I, it doesn’t scream Indiana. While I understand that Hoosier fans are the ones who will be watching these helmets most often, we have to understand that this is a branding ploy, and very few people outside of the Hoosier football culture will correlate the Block-I with Indiana. Most have said if anything it looks like a red Illinois helmet. Also while I like having a helmet that is a bit more traditional, this particular one doesn’t have much eye appeal for the young recruits. The Hoosiers will use their regular red helmet, but instead of having the interlocking “IU” on both sides of the helmet, one side will have the Indiana State flag. Many people see this as a bit of a pie in the face of in-state rival Purdue. While winning the state is important for growing the fan base, fans that already root for either IU or Purdue will not change allegiance because of a helmet design. If I am being completely honest, this is my least favorite helmet of the five. I don’t think that the state flag makes for a great visual effect on the helmet. It actually looks quite awkward in fact. In addition, the whole idea of the concept of wearing multiple helmets is to be cool and trendy, and I don’t think that either of those are displayed very well in this design. I am however rather excited about the fan reaction to this helmet. The fans seem to have loved it and that’s a big plus. While I understand the concept behind the helmet, it just looks plain awful. It may not look horrendous in a still photo, but there is no way that this thing will look good on the players heads during live game action on TV. Fans and recruits will have their favorite and most definitely their least favorite helmet, however we must remember the desired goal of the new headgear. Fans and college football media from all of the country were talking about Hoosier football at the beginning of June. This was a branding and recruiting move for Indiana, one that looks, at least at the beginning, as if it has worked out well for the Hoosiers. While all of the helmets look good up close it will be interesting how their looks will translate onto your television or your view from your seat in Memorial Stadium. Feel free to let us your favorite helmet and why either bellow or on Twitter, at @Hoosier_Huddle!